I really thank all the companies and people (mainly startups CEOs) who have talked to me about very interesting projects. Currently I’m working freelance as a designer, but I decided to start a company focusing on design. Also, utilizing the skills and experiences I’ve acquired while helping several startups, I’ll do my own business (starting from small). 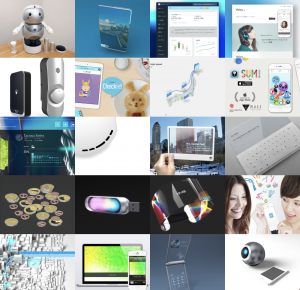 Product designs– Concepts, Products, Digital Signage, etc. The company title “Enfani” comes from French words “enfant (child)” and “infini (infinite)”. It aims to ultimately increase the level of human intellect by sharing buried (mainly, but not limited to kids’) talents, touching words and discoveries. Humanity’s best part must lie in pure minds. The strength of my designs is that I bring out your inner playfulness through my designs, which enthral not only children but also adults. I aim to produce things that bring as much shock and pleasure to adults, as children. As for my own business, I’m also involved in developing our original products, like the iPad app that was just released yesterday. But the products are planned to offer much more than enjoyment from play in later stages, which I’ll elaborate soon. First of all , here’s the app. Plus? Minus? Equal? Just feel them before going math! When teaching someone to calculate for the first time, numbers can often be represented by a shape, like a circle. Use of shapes allows for a visual understanding of the concept, since the quantity of shapes increases when added, and reduces when subtracted. SUM! is an app that teaches the concept of addition and subtraction in a similar manner through play. Moreover, it is fun as a simple game. In the app, the nature of the numbers is represented as the personality of the characters. Just as each child has a unique individuality, each number has a unique face and personality. It’s an app for not just kids, but everyone, to enjoy adding and subtracting to build familiarity with numbers. As I mentioned, this app is just a first product and not the goal.